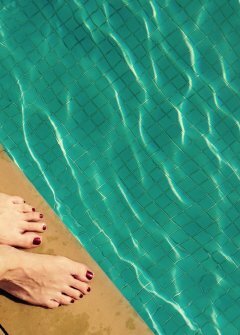 A foot bath with our All Natural and Organic Seaweed powder and Dead Sea Salt will promote the healing of skin irritations like excema and psoreasis. It moisturizes your skin and stimulates your bloodcirculation. 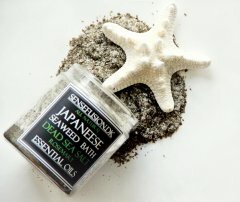 The seaweed further more offers nourishing minerals and detoxing properties and the organic esssential oils we've added are beneficiary for dry skin and and brightens your mind. Suggested use: Dissolve 1 dl in your food bath or 3 dl in your bathtub and soak for 30 min. Soaking in this Epsom bath salt with bicarb soda is the king of remedies for your sore muscles, as the magnesium sulphate content is readily absorbed through the skin for fast relief of the inflammation. 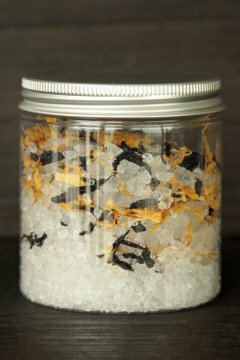 We have also included a selection of anti-inflammatory and antispasmodic essential oils to this bath salt that makes it a double brilliant all natural remedy for back pain, cramping, or tired, sore muscles. The organic sesame oil's abilities to remove toxins, improve blood circulation, and protect the skin from free radicals are beneficial for both oily and dry skin. It moisturizes the skin, slows down the skin aging and helps repair damaged skin cells. We also mixed in dried organic marigold flowers well known for their softening and healing properties. Suggested use: Dissolve 1 dl in your food bath or 3 dl in your bathtub.